Math 108. Topics in Combinatorics. Math 108. Topics in Combinatorics: The probabilistic method. 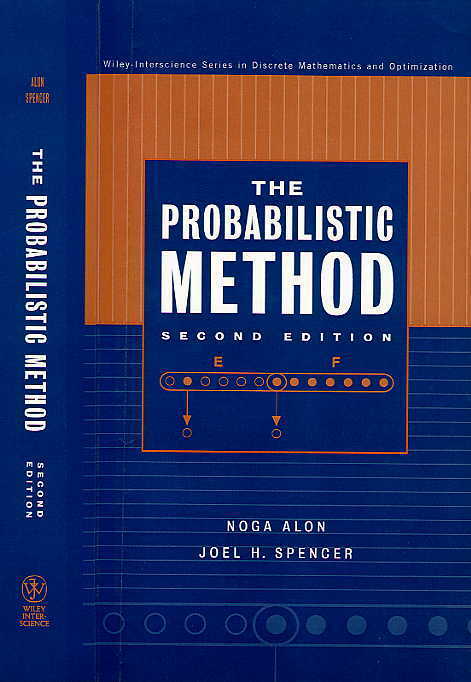 The probabilistic method is a powerful tool to tackle many problems in discrete mathematics. Roughly speaking, here is how the method works: in order to prove that a certain object with some desired properties exists, one shows that a random object selected from an appropriate probability space has the desired properties with positive probability. This method uses randomness to prove theorems that involve no probability themselves, and that would otherwise be very difficult to prove. The probabilistic method has recently been developed intensively and it has become a very useful tool in Combinatorics and Theoretical Computer Science. This course is based on a course taught by Joel Spencer while visiting MIT a few years ago. · Problem Set 1. Due on Tuesday, Jan. 22. · Problem Set 2. Due on Tuesday, Feb. 5. · Problem Set 3. Due on Tuesday, Feb. 19. · Problem Set 4. Due on Tuesday, Mar. 4. Another useful source are these notes by Jiri Matousek and Jan Vondrák. Here’s a tentative list of topics that I will try to cover. Chapter 1. The basic method. Examples. - 2-colorable families. Upper and lower bounds. Chapter 2. Linearity of expectation. - Hamiltonian paths in tournaments. - Ranking the vertices of a tournament. Chapter 4. The second moment method. Chapter 8. The Poisson paradigm. - Random graphs: isolated points, connectivity. Chapter 5. The Lovász Local Lemma. - Lower bounds for Ramsey numbers. - The evolution of random graphs. The grade will be based on the homework and a project presentation. There will be no exams. The homework will consist of a problem set every two weeks. You are encouraged to collaborate on the homework, but the solutions must be written individually. The project will consist of preparing a topic, individually or in groups of 2 or 3, and presenting it in class. Here is a list of suggested projects. Last modified on Mar 3, 2008.